This action packed story in this stunning ice-skating adventure, will take you to Neverland where you'll meet pirates, Indians, Peter Pan, Tiger Lilly, Mr Smee and of course everyone's favourite baddie, the vengeful Captain Hook! 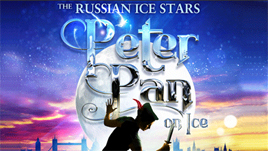 This famous fantasy adventure is portrayed in an amazing spectacle of theatre and skating performance. The Royal Theatre are delighted to welcome this major production by the The Russian Ice Stars and involves creating an 8cm-thick ice rink, containing 14 tons of actual frozen water, and bringing a stage set and equipment to the west of Ireland that will just about fit in two 40ft trucks! "So come with me, where dreams are born, and time is never planned. Just think of happy things, and your heart will fly on wings, forever, in Never Never Land!" Ticket prices: Child €17.50, Adult €27.90, Premium Ticket €32.50, Family €75 (2 adults & 2 children, or 3 children & 1 adults). Group rate: one free in groups of 10 (please note, this offer is only available at The Royal Theatre Box Office). For any queries please call The Royal Box Office on 094 9023111.